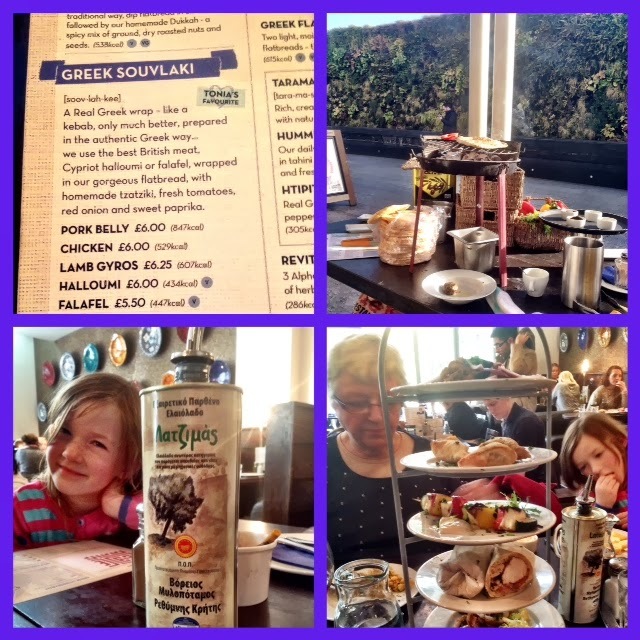 JustAnnieQPR: The Real Greek - We Are Dining in W12! The Real Greek - We Are Dining in W12! I was set a challenge, to take on a Westfield London restaurant's signature dish head to head. Had lots to choose from, and was torn between Mexican Wahaca, Brasilian Cabana and The Real Greek.................I settled on The Real Greek in the end, as I am more familiar to Greek food, (we have a Villa Annie in Crete that we frequent). We headed to Shepherds Bush for the day (home to the mighty Super Hoops), and picked up my mum on the way. The signature dish here was the Souvlaki, a popular dish across Greece, and served slightly differently depending on where you are. In Crete the Souvlaki would simply be skewers of BBQ's meats, and if in a wrap it would be known as Gyros - which translates as "plate" i.e. it is a meal in one. Here the Souvlaki was served in a flatbread wrap, with their own home-made tstatsiki, red onion, tomatoes, sweet paprika, and a choice of meats, haloumi or falafel. I opted for the chicken. It was truly scrummy, the flavours transported me straight back to the little shop in Kalyves where we often stop for lunch..........I must go back to W12 and try the other fillings too, I love haloumi/squeaky cheese as we call it (though I would say this is more a Cypriot ingredient). Anyhoo, I digress. I have since produced my own version of this dish. It was every bit as yummy, and I enjoyed making it, as much as I enjoyed watching the kids devour it. We are off to Crete in April, and this has just served to make my heart pine for my little piece of Greece.........bring on the sunshine! Annie's Chicken Souvlaki with Tzatziki, red onion and tomatoes in a flatbread wrap! 500g chicken thighs (skinned & boned) and cut into squares. Combine all the ingredients and marinade for a minimum of 2hrs, but longer if you have time. For the tsatziki (this makes plenty)! Again, combine all the ingredients and put in the fridge for 1-2 hours. You will also need flatbreads, skewers, tomatoes and red onion, or whatever other fillings you like. I also added grilled sweet peppers. When you are ready to go, thread the marinated chicken onto skewers - if using wooden ones, make sure you have pre-soaked in water for at least 15 minutes. Put under a medium grill for around 8 minutes a side, until no longer pink in the middle. Load the flat bread with the chicken, a couple of spoons of Tzatziki (to taste), tomatoes, onion etc. wrap and eat. In Crete, when you order the Gyros, they put chips in it too, the kids and Chris like it, but I always take mine out - a carb too far in my mind, but hey as you like it!